Bridgewater, MA – Saturday after Saturday the Overdue Blues Band delivers great live musical entertainment at the Riviera Cafe Brewhouse. March 4, 2017 officially marked 5 years of bringing open mic blues jams to local musicians and fans alike. The house band features Robert John “RJ”, Magic Gary on guitar, Butch “the Gruvekeeper” Hirtle and Brian Calabro on drums. The show opens at 4pm with performances by the band before opening it up to the audience until 8pm, no cover for entry. Locals quickly become regulars at the show and build great lasting friendships. Bring your axe, your appetite and your dancing shoes! 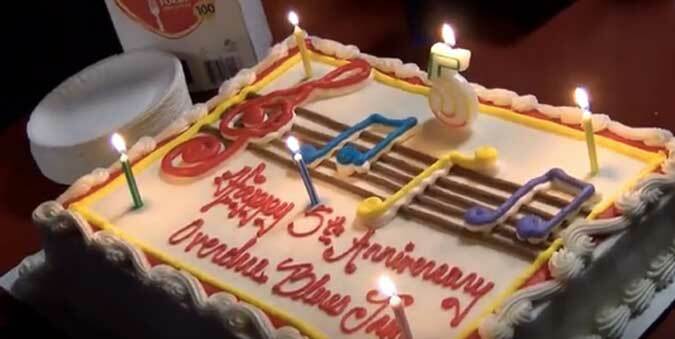 Happy 5th Anniversary Overdue Blues Band!